Preschool Piano Lessons for ages 3 and up: nurture their talent! Sweet Symphony now proudly offers preschool piano lessons! Our preschool piano lessons are used worldwide, are specifically designed for preschool children aged 3-5 years-old and are really popular! Lessons are 30-minutes long and broken into various segments. Each segment focuses on different areas of learning music – spotting patterns, identifying rhythms, recognising high/low sounds etc through various interactive activities such as games, songs, and teacher-student duets. Children work through their own lesson book with their teacher, which has all of the materials needed for the lesson, as well as an activity sheet to complete at home with their parents (don’t worry – you don’t have to be musical!). These lessons provide a firm foundation for moving into regular piano lessons when your child is old enough. Q. 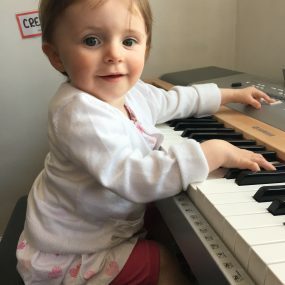 At what age can my child start preschool piano lessons? A. The preschool programme is designed for children aged between 3-5. But we all know that every child is different. To help you decide whether your child is ready, download this handy checklist. Q. What happens when my child starts school? Do they have to stop their lessons? A. Not at all! In fact, they’ve had the best possible start to their musical education and should be able to transition easily into our regular piano lessons to continue their progress.